We all want the luck of the Irish. We all want to lay our hands on some leprechaun gold. So we set our leprechaun traps. We wait patiently for a clumsy little man dressed in green to fall into them. We always fail in our endeavors though. Some people tell us that we are crazy, that there is no such things as leprechauns. But we know better. They possess magic. A magic that hides their gold. gold filled his halls, and his name was Shaun. But only John was so bold. An Irish spell cast, stopped him at dawn. But, you know that leprechauns exist. You know they do, because you have a gold filled halls. You know, because you have a little magic. 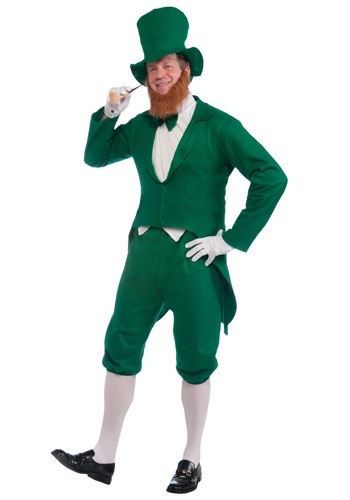 Put on this Leprechaun Costume, and protect your gold from all of us would be thieves. Use your magic to protect what is yours. Keep John's hands off your precious treasure. Cast an Irish spell, and don't fall into our clumsy leprechaun traps. Although, we would probably leave your gold alone if you convinced all of our friends that we weren't crazy. Convince them that leprechauns exist. That magic is real.